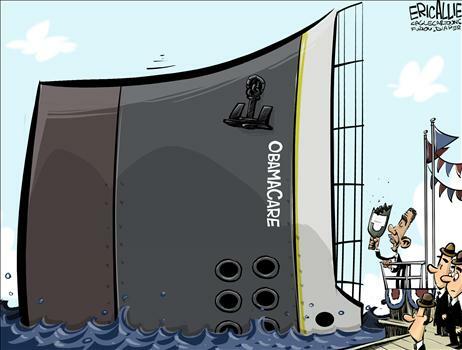 Back in 2009, before Obamacare, the United States had a healthcare system that was plagued by excessive government intervention, which led to a third-party-payer crisis and massive inefficiencies. Perversely, the President thought the way to solve these problems was even more intervention, even though lots of people were warning that additional government spending and added intervention would make a bad situation even worse. 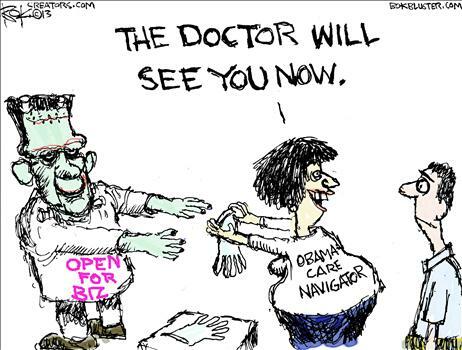 Now that it’s 2013 and Obamacare is being implemented, it seems (what a surprise!) that critics were right. Amazingly, even the New York Times is being forced to acknowledge that Obamacare is turning into a typical government cluster-you-know-what. …the chief digital architect for the Obama administration’s new online insurance marketplace, told industry executives that he was deeply worried about the Web site’s debut. “Let’s just make sure it’s not a third-world experience,” he told them. Two weeks after the rollout, few would say his hopes were realized. For the past 12 days, a system costing more than $400 million and billed as a one-stop click-and-go hub for citizens seeking health insurance has thwarted the efforts of millions to simply log in. The growing national outcry has deeply embarrassed the White House, which has refused to say how many people have enrolled through the federal exchange. Not exactly the launch the President was hoping for, huh? Eric Allie’s cartoon is a much more accurate portrayal of what’s happening. And contrary to what the White House is claiming, the problems go way beyond opening-day glitches. “These are not glitches,” said an insurance executive who has participated in many conference calls on the federal exchange. Like many people interviewed for this article, the executive spoke on the condition of anonymity, saying he did not wish to alienate the federal officials with whom he works. “The extent of the problems is pretty enormous. At the end of our calls, people say, ‘It’s awful, just awful.’ ” Interviews with two dozen contractors, current and former government officials, insurance executives and consumer advocates, as well as an examination of confidential administration documents, point to a series of missteps — financial, technical and managerial — that led to the troubles. By the way, notice how people don’t want to speak on the record, presumably because of concern about vindictive persecution by the Obama Administration. By itself, that should be a huge story. But let’s stick with the coverage of the Obamacare disaster. 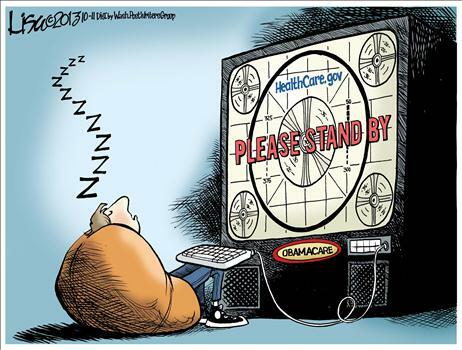 As you can see, the Lisa Benson cartoon is right on the mark. …just a trickle of the 14.6 million people who have visited the federal exchange so far have managed to enroll in insurance plans, according to executives of major insurance companies who receive enrollment files from the government. And some of those enrollments are marred by mistakes. Insurance executives said the government had sent some enrollment files to the wrong insurer, confusing companies that have similar names but are in different states. Other files were unusable because crucial information was missing, they said. Many users of the federal exchange were stuck at square one. A New York Times researcher, for instance, managed to register at 6 a.m. on Oct. 1. But despite more than 40 attempts over the next 11 days, she was never able to log in. Her last attempts led her to a blank screen. But it’s not just the people trying to obtain insurance that are having an unpleasant experience. The people who already have insurance are experiencing Obamacare sticker shock. A North Carolina newspaper reports on bad news for health insurance consumers in the Tarheel State. The Buncombe County resident, who along with her husband is self-employed, had been buying a policy from Blue Cross and Blue Shield of North Carolina. The couple paid $341 a month for a policy with a $10,000 deductible. Recently, Campbell, 53, got a letter informing her that her plan was not compliant with the Affordable Care Act and would no longer be available. It suggested a new plan with an $11,000 in-network deductible and $843 monthly premium. …John Wingerter, director of health insurance information services at the Council on Aging of Buncombe County, says he’s gotten at least a dozen calls from people who say their rates have increased dramatically.Some have said their rates have doubled or more than doubled. And the Albuquerque Journal reports on some unfortunate people in New Mexico who have been victimized by Obamacare. Robert Hare was happy with his insurance. So were Gregory Rothrock and his family. Yet, their insurance must change, and it will cost them more money. …Hare said his individual plan now costs him $87 a month and has a $5,000 deductible. The new plan will cost $211 and includes benefits, such as maternity coverage, that are required by the ACA but which Hare doesn’t want. …As for Rothrock, depending on which of the three levels of coverage he chooses, coverage for his family of three could be as much as 360 percent more costly. 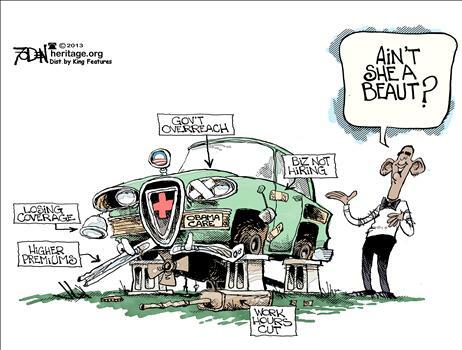 Hmmm…I thought Obamacare was supposed to bring insurance rates down?!? And didn’t the President promise that people could keep their plans? Does this mean – gasp! – that the folks in Washington have been lying to us!?! The Chip Bok cartoon above is an amusing – and disturbing – look at what’s happening. And when you add it all up, this Glenn Foden cartoon is a good summary of what we’ve been saddled with. Which explains why I’m glad some lawmakers are still fighting Obamacare, even though they face very difficult odds. P.S. If you want to enjoy some more Obamacare humor, click here, here, here, here, here, here, here, here, here, here, here, here, and here. P.P.S. If you want to know how to restore a functioning market-based healthcare system, this video from Reason TV is must watching. P.P.P.S. If you want to know where Obamacare will probably take us, peruse the horror stories about the U.K. system linked at the bottom of this post. Of course, there’s some kind of law against just putting $341 a month in the bank and paying your own bills. You said it Zorba. We are strolling down Hayek’s Road without a care in the world. Therefore now, the major portion of political energy (politicians voters etc.) will concentrate on how to fix it. The elephant in the room ( “hey look! I no longer have to work for my healthcare sometime in my life — and thus I’m starting to acquire the same incentives to production as the French” ) will be ignored. The path to decline is proceeding the same way for Americans, as it has for Europeans. Nothing exceptional so far. Same dreams, same narratives, same slogans, same hope that competent people will be convinced — or ultimately coerced — to get up every morning and go work half their day for the benefit of distant others AND, of course!! with enough residual enthusiasm to outcompete the remaining six billion of this planet. Good luck then dear Americans being another data point in the decline set of HopNChange.